Came here for Monday date night with my boyfriend FG (read about me section for more info) having heard so much about the ‘Office burger’. It has been written about by many bloggers as the best burger in LA and was described in Esquire magazine as ‘one of the best burgers in the World’. The main attraction to the burger is the applewood smoked bacon compote and the dry-aged beef. 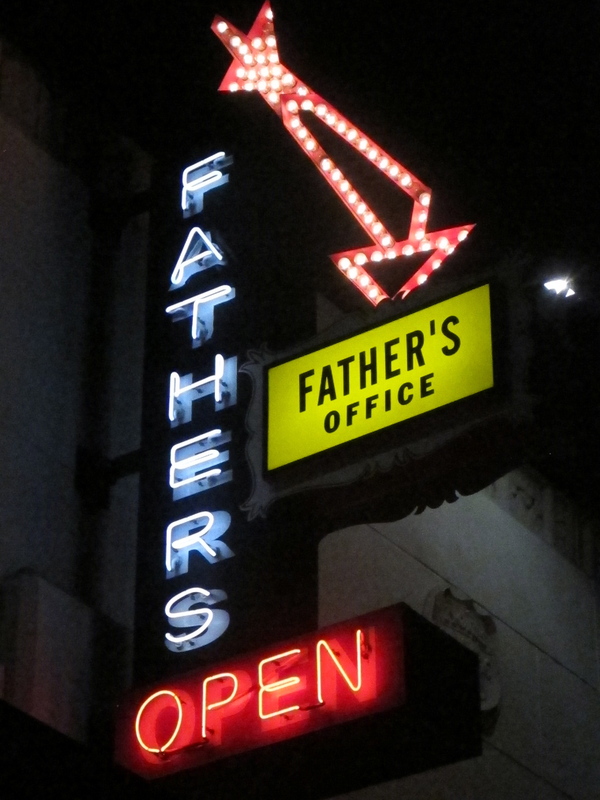 Chef Sang Yoon was in charge of this creation at the original Fathers Office location in Santa Monica. This location we went to in the Helms bakery building opened up in 2008, but follows the same standards and rules as the original location. I had heard good things about the food and beer prior to coming here, but didn’t really know what to expect other than it is described as a ‘gastro pub’. I had feared it would have a sports bar feel to it due to the TV screens and so many beers on tap, but they have definitely made this more upscale than that. A nice long wood bar, low ceilings with edison era light bulbs hanging all the way along made the place warm and inviting. It was anything but a sports bar and had a great slightly romantic ambience. Please note they do not allow modifications or substitutions of any kind here, and they mean it. I don’t usually like this idea in restaurants because 1. I’m fussy! and 2. I do have allergies to some items. Seeing as I wasn’t allergic to anything on the list I wanted to eat this time, there was no need to bother them on this point. I should talk a little about the beer menu. I don’t drink much beer myself, but do enjoy themaltier beers and on occasion a porter or stout. Their list is extensive here and documented nicely in the menu with a good description below each one. This is great for someone like me who really doesn’t know names of beers or what direction to go for usually, the descriptions made me WANT to try the beer! For example, Bear republic Heritage Ale was described as ‘Deep roasted chocolate and smoke with biscuit undertones’. YUM! Despite being a beer place, I decided not to go with a beer but try a speciality cocktail instead because I had heard they put effort in to this aspect of the menu also. I ordered a ‘Oaxacan Fizz‘ purely because I was intrigued by the ‘tobacco syrup’ they make here. Now, my boyfriend and I don’t smoke. I don’t often enjoy mescal type drinks for that very reason, I used to think it tasted like water in an ashtray to be honest but recently my palette has been adapting to the smokiness of these drinks and i’m actually beginning to like them! It was pretty smoky as the ingredients would suggest, but it had something to it that i really enjoyed. It was refreshing and light despite its smokiness, no doubt due to it being on ice with seltzer. Actually FG did point out it is technically a collins not a fizz because it has ice. A lot of people don’t realize that a ‘Fizz’ is a type of drink, its like people who mix up a ‘Fix’ and a ‘Sour’, the only difference is whether or not it’s on the rocks but it does become a different drink genre for those who didn’t know! Anyway, it was tasty and the tobacco syrup turned out to be pretty potent. FG got a real buzz off it actually, and seeing as he’s never even tried a cigarette in his life, he couldn’t figure out why he felt so light headed after one drink. Our bartender Mike (who was great by the way) commented on the fact they make the syrup in house by steeping a really high end tobacco in sugar water so he’s most likely getting a high off of that. If you like smoky, you’ll enjoy this drink….and the buzz you’ll get too! 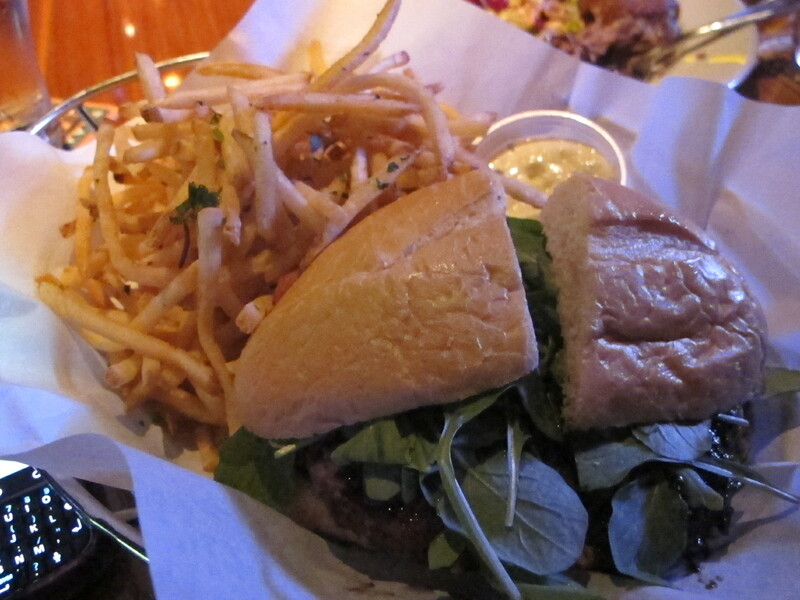 We decided to order the burger med/rare with frites and the duck salad. As I mentioned before, this burger has won several awards and been noted as one of the best burgers in the World, so needless to say it had a lot to live up to. I don’t usually like onions on my burger at all, but no modifications meant i had to bite the bullet and taste it regardless….i’m glad I did. The caramelized onion bacon mix was superb and worked beautifully with the two cheeses. It was rich in flavor without being greasy or overpowering. The meat was cooked to melt in your mouth perfection at medium rare, it was soft almost like butter and had all its flavor still intact. Sadly the soft bun was nothing special, and I felt could have been crispier against the softness of the meat etc. Not sure if it would get my ‘best burger’ title, but is certainly memorable. The only aspect I didn’t like about this dish was the frites, ours were a little over cooked so tasted more like crispy sticks than fries, I never really like the spindly chips (as I call them), I prefer a thicker cut and we regretted not ordering the sweet potato fries which the man next to us got and they looked delicious. The garlic aioli that accompanied them made up for it though, wow was that good. Creamy with just the right amount of seasoning. Chef Sang Yoon doesn’t allow any ketchup in the building, so don’t bother trying to get it. I am glad of this fact, because the aioli was just perfect. The salad was also very tasty. It had citrus and asian inspired flavors throughout. Each bite would move through stages, you’d get a burst of sweetness, that would become sour and end with a slight bitterness. The orange of the Tangelo Vinaigrette cut through the richness of the duck meat and complimented it nicely. I wish there had been more green on the plate as apposed to so much frisée, but I was by no means disappointed with the dish as a whole. I really enjoyed the addition of figs and hazelnuts too. The duck was cooked well and I realized from the two dishes, they really know how to cook their meats to perfection here. Other menu items that intrigued me (I didn’t get to taste this time round) were the ‘Hawaiin Butterfish’ and ‘Steak Au Poivre’, I would no doubt try this on the next visit. My drink rating here is a tricky one because it’s based only on one cocktail. I am giving this place a 4 out of 5 clover clubs which is VERY generous, but only because the beer list is so extensive there is bound to be something for everyone and the drink I did have was enjoyable and different. It looses a point for the mistake of a ‘Fizz’ and not being able to taste the syrup to distinguish the mescal from the tobacco. The food we ate was all good but not exceptional in my opinion. It looses points for the disappointing over cooked fries and the lack of green on the salad. 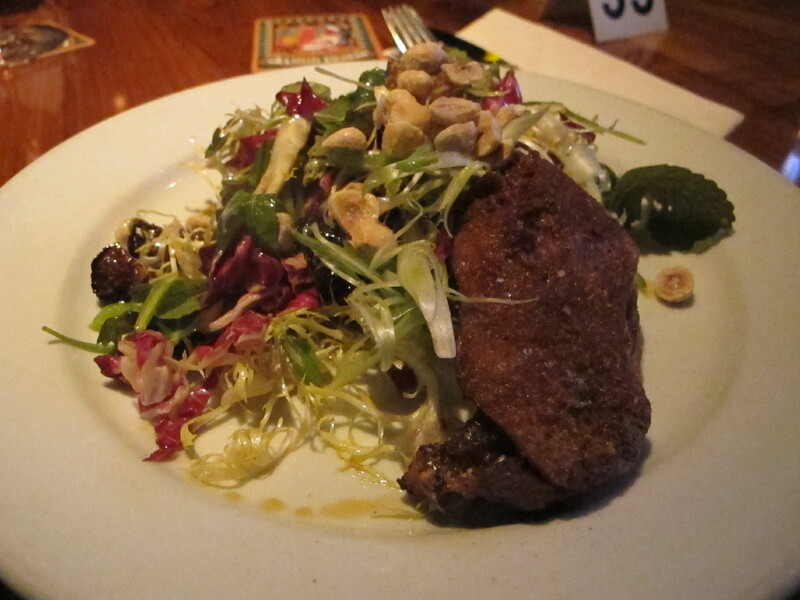 Also I kind of wish they’d cut the duck over the salad as apposed to a big chunk of duck meat on the side, but that’s just a personal preference. The menu choices were interesting though and I would be happy to return to try more food in future. All in all it was a good experience, food and drink was reasonably priced, service was quick and the staff were friendly. A place worth checking out, especially if you like a good pint! If anyone has any comments on this location in comparison to the Santa Monica one please let me know, I will no doubt check out the other spot in the near future also.